3. Click on "Start" Button to start First Ball moving into the frame. 4. 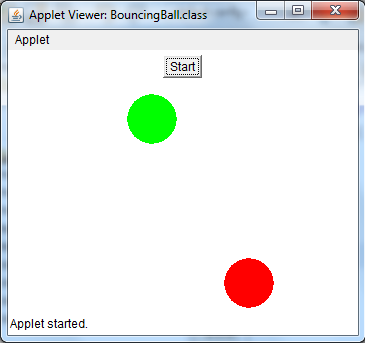 Click on "Start" Button again to start Second Ball moving into the frame. Note: After two clicks the "Start" Button is disabled. The strategy used in this example is very simple. Each thread is assigned to one Ball. You may modify the given code as per your requirement. Check above Image to understand an instance of execution of the same program. Also following are another Images of same program at different time intervals.